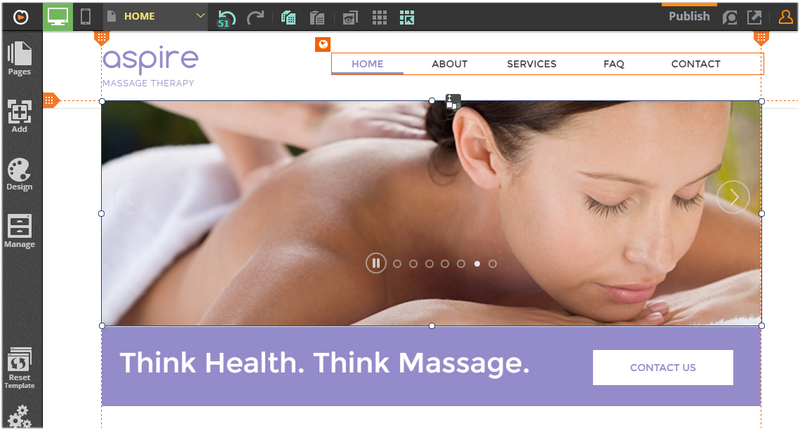 Using professionally-designed, ready-to-use templates is one of the benefits of a website builder. It lets you create a professional-looking website quickly, easily and affordably. But how do you choose the perfect template for your website? In this article, we will take a look at the Website.com website design template library and how to choose the right template for your website. We will also show you the types of customizations you can make to your Website.com template so that it better fits your needs. 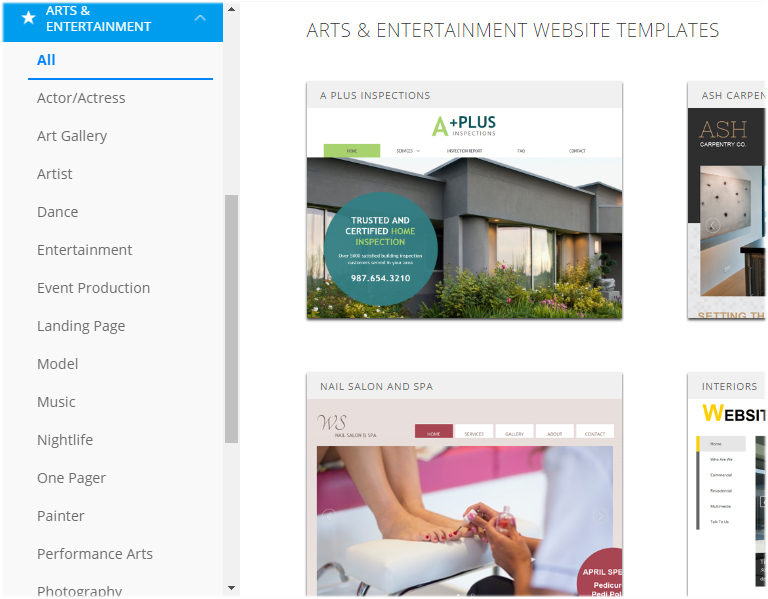 Website.com offers hundreds of professionally-designed and fully-customizable website templates that span over 10 main categories, each with their own set of sub-categories. For example, under the ”Arts and Entertainment” category, you’ll find the sub-categories of Art Gallery, Artist, Dance, Entertainment, Event Production, Model, Performance Arts, and much more. Each template also comes with a full preview – you can play around with the functionality of the template, click on pages and buttons, navigate all over the preview site. This allows you to select the template with more confidence. In addition, all templates are fully compatible with mobile and handheld devices. What to look for when choosing a website design template? When deciding on a template, the number one question to ask yourself is how much customization do you want to do? So, when looking for a design template for your website, you should try to find one that best fits your needs and at the same time, limits the required customizations to the easier ones. If you need to do an overhaul on a template at the code-level, then that template is not right for you. Once you have chosen a template for your website, you can begin customizing the design – all Website.com’s templates are customizable. 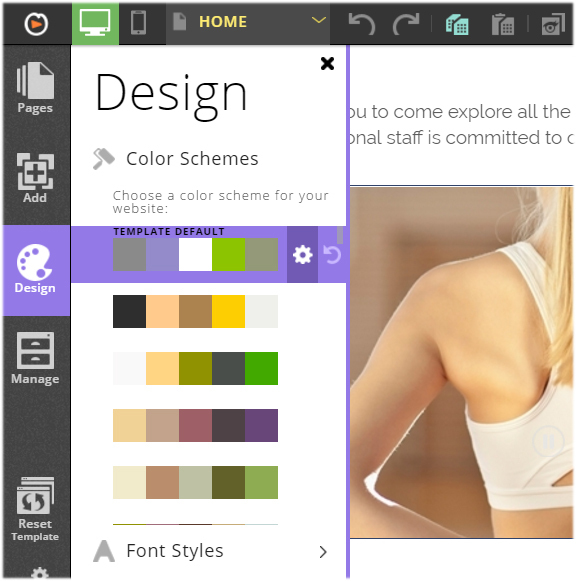 Although Website.com doesn’t allow site customization at the code-level, you can customize the template’s color scheme, background image/color, font and text styles right from the editor. For example, Website.com comes with a collection of free, web-safe Google Fonts that you use to replace the font style of your chosen template. You can also change the template’s color scheme by selecting from our library of pre-designed color palettes. Changing your website’s color scheme is easy – Website.com comes with a library of pre-set color palettes that you can easily swap into your template. 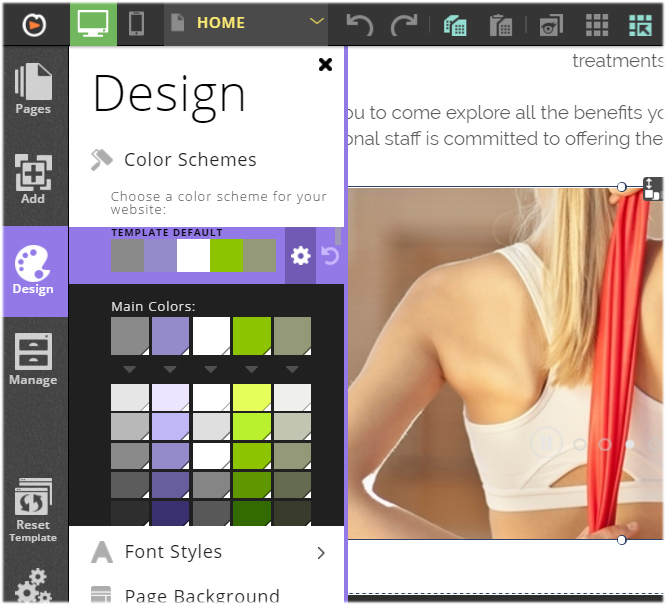 Just click on the palette you like and the new colors are applied to your website. Each color is also customizable, you can change any color in the palette. This allows you to easily transform a template to match your business’ brand. Font-wise, Website.com offers all the standard web-safe fonts such as Arial and Georgia. Website.com also offers a selection of Google Web Fonts. 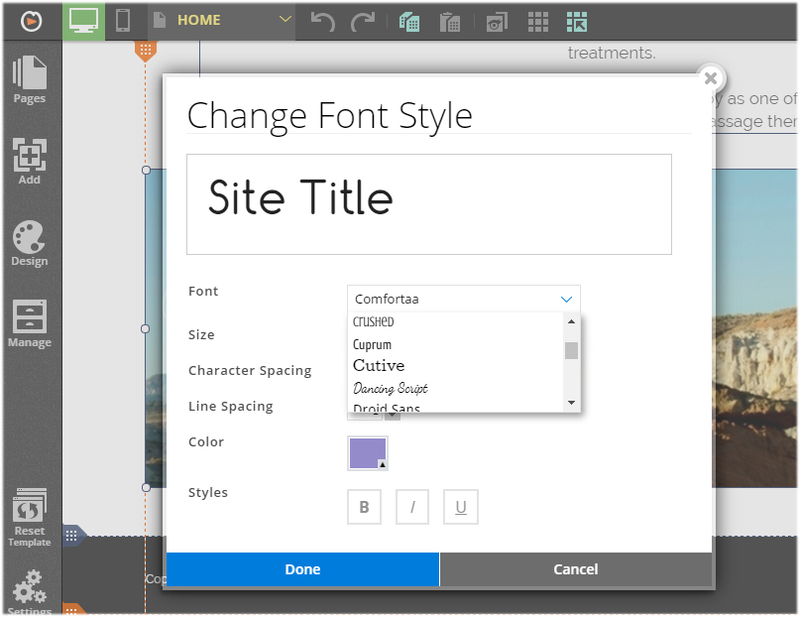 While site color scheme, font style and page background are one-click customizations, Website.com also supports drag-and-drop customizations of your template. These customizations include modifications to your homepage design, menu bar design and page header design. Yes, you can change the homepage and page header designs of your website template, and it’s all done by drag-and-drop. Website.com’s platform relies on “absolute positioning” and there is almost no limitations on where you can place elements on your web page. 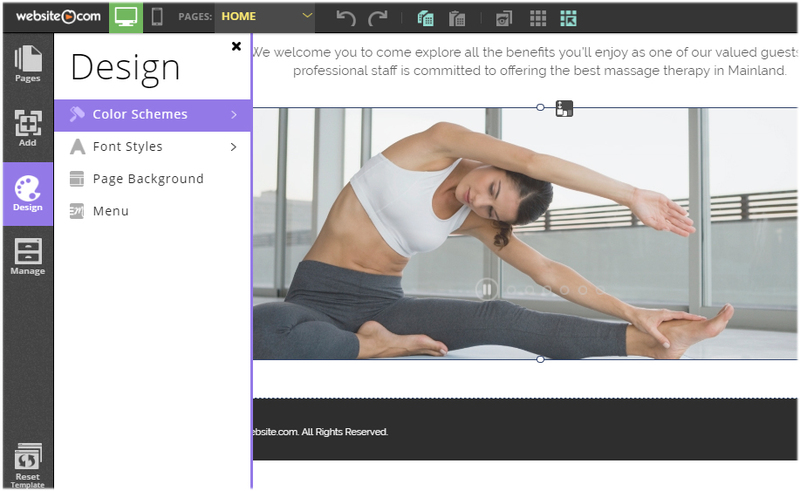 In other words, you can add and move elements around, rearranging them to better fit your needs, including your site logo, menu bar, header image, and more. For example, you can easily add an image slider in your page header or reposition the site menu bar underneath the header image. Should I stay within an industry when choosing a website template? No, you shouldn’t limit your template selection to your field or industry. 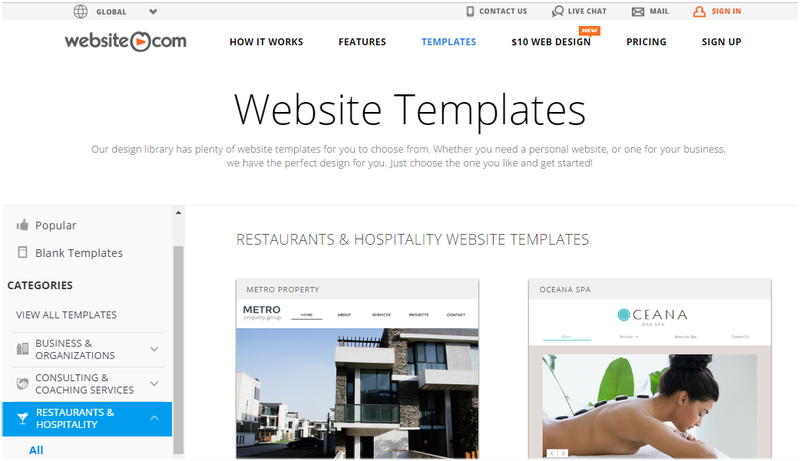 Many website design templates are created with a specific theme in mind. A template takes into account the specific needs of the website owner and it is designed with the type of business or service in mind – in other words, the closer the template is to your industry, the less overall customization will be needed. But keep in mind that a theme is not restricted to any industry. Often, it is the template’s stock images and sample content that makes a template a certain industry. Once you remove images, you will see that a handful of the templates actually do look very similar. Don’t choose your website template based on the sample images on the template – you will be replacing them with your own images anyways. In other words, don’t be distracted by the sample content. Instead, look for a template that has a layout that meets your needs. How do you want your homepage to look? What kind of site menu do you want? Do you need a one-page website? Are you looking for an online store template? Is the template flexible enough to allow the integration of the features you need (ie. blog, photo gallery, videos, forms, social sharing buttons, etc.)? And just remember, Website.com’s templates are fully-customizable, if there’s anything you don’t like, you can easily change it to make it work for you.